Yes! There is a real Baby Kay! 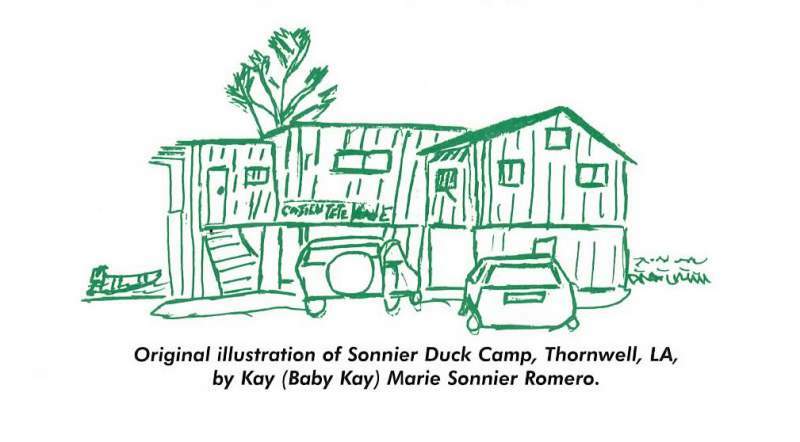 Her name is Kay Marie Sonnier Romero. Most Cajuns have nicknames. Because her mother’s name was Katie, her father always called her Baby Kay. She was raised in New Roads, LA, among great Cajun cooks, overlooking beautiful False River. After her marriage to Dr. Rosie Romero, an LSU medical school graduate, they moved to his hometown, Welsh, in Southwest LA. He practiced general medicine there for 11 ½ years, and still found time for he and Baby Kay to raise 7 children. Their Cajun heritage was a part of everyday life. Baptism, First Communion, Confirmation, Weddings, Funerals, … all are celebrations for family get-togethers , including abundance of good Cajun food and music. After a residency in Denver, the family moved to Scottsdale, AZ in 1966, where Dr. Rosie opened an Allergy and Immunology Clinic. First impressions proved to be true. No Cajun food – no crawfish – no jambalaya – no etouffee, etc. The food being served in restaurants then was anything doused in cayenne pepper, or blackened, and called “Cajun”. What an insult! The decision was made, with the help of some children and spouses, to open Baby Kay’s in Scottsdale, April 6, 1989. The Town and Country Restaurant in Phoenix opened in 1993, all the family and spouses have supported Mama in different ways. Baby Kay says, “I love meeting the people – locals and visitors alike. They all ask – what made you do this? It was fun, introducing good Cajun food to the West – and remember: Cooking is like making love, …. If you don’t like to do it – Don’t! 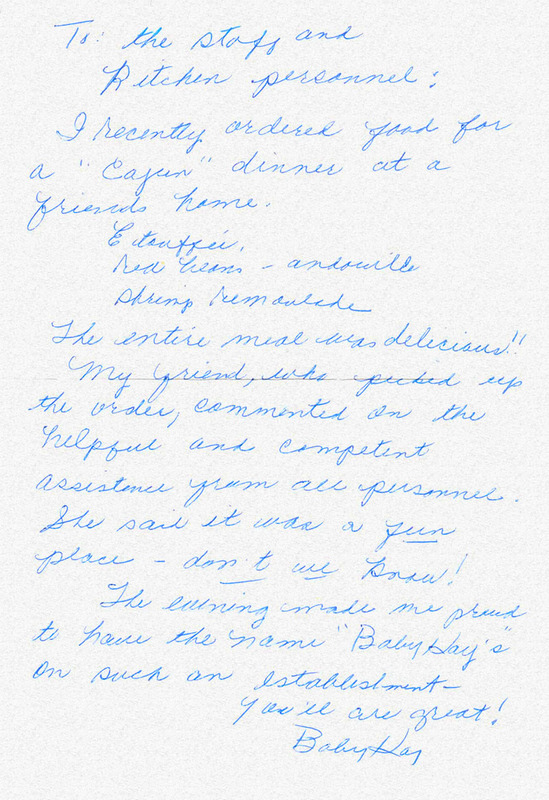 View the original note below written from Baby Kay herself to the new owners of Baby Kay’s Cajun Kitchen.